Traction control science is making its way to motorcycles. Motorcycle Traction Control Systems help you to accelerate, brake and steer properly and efficiently, which obviously makes riding safer and easier than it would be normally. It is particularly useful when riding over slippery surfaces, as it can aid you in maintaining enough grip to help your bike stay on the road while increasing your speed under these conditions. Most riders haven’t the skills [yet] to manage such circumstance—and maybe there will be less need to! More commonly referred to as “Electronic Stability Control” (ESC), it’s a computerized technology introduced around 1995 for improving the safety of a vehicle’s stability by detecting and minimizing skids or loss of grip. When ESC detects loss of steering control, ESC automatically applies the brakes to help “steer” the vehicle where the driver intends to go. Some ESC systems also reduce engine power until control is regained. ESC does not improve your bikes cornering performance, rather helps to minimize loss of control. According to the American Insurance Institute for Highway Safety (IIHS) one-third of fatal auto mobile accidents could be prevented by this very technology! It was first introduced in auto-mobiles from what we can gather initially in 1932. Ferdinand Porsche designed a Grand Prix racing car where the high power of the design caused one of the rear wheels to experience excessive wheel spin at any speed up to 100 MPH. In 1935, Porsche commissioned the German engineering firm ZF Friedrichshafen AG to design a limited slip differential that would perform better. In 1987 the earliest innovators for ESC, Mercedes-Benz, BMW and Toyota introduced their first traction control systems. Traction control works by applying individual wheel braking and throttle to keep traction while accelerating but unlike ESC it is not designed to aid in steering. Traction refers to your tyres’ grip on the road – the more traction you have, the more grip you have. You need to have traction to accelerate, brake and steer effectively. If your bike does not have enough traction, it will be harder for you to do these things well, even with the right driving skills. 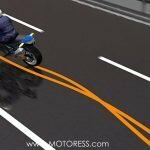 How does Motorcycle Traction Control Work? In general application, Motorcycle Traction Control systems (TSC) uses wheel-speed sensors to gauge the speed at which the wheels are spinning. If one wheel is spinning more quickly than the others, it would be easy for you to lose control. As soon as the sensors pick up a difference in speed, the Traction Control system encourages the brake to lessen the speed of that wheel so that it slows down in line with the speed of the other wheels. This limits the chances of skidding or sliding off the road. Although Motorcycle Traction Control does help your vehicle to grip the road better in bad weather conditions the system does not increase the amount of grip that your tyres have – it simply prevents them losing the grip that they do have. 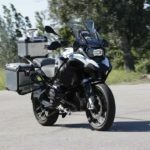 Do all Motorcycles have Traction Control systems? Not unless specified, yet Anti-lock Braking System (ABS) which is one of the most common forms of Motorcycle Traction Control can be found on an increasing number of motorbikes. If you have to brake hard, this system stops your wheels from locking and going beyond your maximum braking threshold—which without ABS usually results in a skid or total loss of control.